Chapter 672: The Hell-Emperor Stele Shakes All Creation! As of this moment, his nascent soul had matured to a certain extent. Not only was it stronger, it was also much more resilient to the frigid qi of heaven and earth. It was an exhilarating feeling, and was normally the type that would come after spending significant time in secluded meditation, cultivating some powerful technique and constantly performing breathing exercises. And that was the result of a single spirit enhancement! Bai Xiaochun thought back to the feeling of the energy of heaven and earth exploding into him earlier, and then his eyes began to shine with excitement. “This really is a secret magic for improving your cultivation base....” Pursing his lips in thought, he recalled the information he had come across when he first arrived in the Wildlands, regarding the successor of the Hell-Emperor. That was when he had first been introduced to the concept of performing spirit enhancements on nascent souls. Immediately, his excitement began to build. At the same time, he realized that performing spirit enhancements on nascent souls obviously produced different results than with other items. That was clear considering what he had experienced when performing spirit enhancements to a very high level back in the labyrinth. However, nascent souls were unique in heaven and earth, and behaved differently from ordinary objects, so that made sense. Looking down at the two- to fourteen-colored flames he had arranged, he realized that his path to the peak of the early Nascent Soul stage was right in front of him, open and clear. With that, he sent his nascent soul flying back into the turtle-wok, where he performed another incantation gesture and pointed out, causing the two-colored flame to begin another spirit enhancement process. Of course, Bai Xiaochun had no way of knowing that even performing a single spirit enhancement on a nascent soul was a heaven-shaking, earth-toppling accomplishment in the Wildlands! Meanwhile, far, far away, in the very heart of the Wildlands, was... a city that vastly surpassed Giant Ghost City in size! It seemed as big as ten Giant Ghost Cities put together, and was completely golden in color. There was something indescribably noble about it, as though it were connected to the heavens. The sky above the city was filled with auspicious clouds, among which a dragon danced, a dragon that occasionally cast intimidating glances at the people below. This city was the most important location in the Wildlands. It was... Arch-Emperor City! In the eastern part of Arch-Emperor City was an enormous public square, fully 30,000 meters from one side to the other. In the very middle of that square was a huge stone stele, exactly 2,700 meters tall, green in color, and surrounded by soft, glowing light. It was a light that seemed so enduring that no divine ability in the world could make it go dark. It was as if, as long as heaven and earth existed, that light could not be destroyed. It was even capable of benefiting the cultivation base of anyone who basked within it. At the moment, roughly eighty names were visible on the surface of the stone stele! Those names were written in precise and clear fashion, and were the names of various chosen heroes, all of them extremely famous, the type who everyone in the Wildlands had heard of and talked about. They were essentially household names. That stone stele was none other than the Hell-Emperor Stele! And as for those names... they were the candidates in the running to be the successor of the Hell-Emperor! When the allotted time for the competition to become the successor ended, then whoever occupied 1st place on that list... would be the successor! Because of how important that competition was, everyone in the Wildlands was very interested in the names on the list. Currently, the first name on the list was Gongsun Yi, and next to it, a number could be seen: seven! That meant that this Gongsun Yi had already performed a sevenfold spirit enhancement on his nascent soul! Unless something unexpected happened, it seemed obvious that Gongsun Yi would become the successor of the Hell-Emperor. After all, not even Zhou Hong seemed willing to go past a sevenfold spirit enhancement. That was no surprise, since the success rate was extremely low, and a failure would lead to death. Because of the list of names on the Hell-Emperor Stele, and the glowing light which surrounded it, there were always soul cultivators gathered in the area. Not only could they improve their cultivation base because of the light, they also could study the names on the list at the same time. The name list wasn't static. New names would occasionally pop up, and sometimes names would fade away. Obviously, the names that disappeared represented people who had attempted a spirit enhancement on their nascent soul, only to fail and perish. As for the new names, they always caused a stir. Of course, the stir for a new name usually wasn’t very much to speak about. After all, new names usually came with only a single spirit enhancement. The only thing that would cause a true commotion was when someone broke into the top 10. However, on this day, something completely unexpected happened with one of the new names on the list!! The first person to notice the new name was a middle-aged soul cultivator who happened to be a member of the Giant Ghost Legion forces that were stationed in Arch-Emperor City. Only a few years before, he had been part of the army that fought the Starry Sky Dao Polarity Sect at the Great Wall. However, by this point, the cultivators of the Giant Ghost Legion had all been recalled to Arch-Emperor City for rest and recovery. At the moment, they were waiting for deployment orders to go back to the Great Wall. That middle-aged soul cultivator was seated cross-legged some distance away from the stone stele, doing breathing exercises. As usual, he was looking at the name list on the stone stele, when suddenly, his jaw dropped as he noticed a new name at the very end of the list. At first, a blank expression could be seen on the man’s face, but then his eyes widened, and his aura began to surge unstably. “This... this....” What he was seeing seemed completely preposterous, and he was actually convinced that he was seeing things.... He rubbed his eyes a few times, and then he looked over again. At that point, he simply wasn’t able to hold back from crying out at the top of his lungs. His cry instantly broke the silence in the area of the stone stele. Countless soul cultivators who were practicing cultivation in the area opened their eyes. Most of them seemed confused; the name Bai Xiaochun seemed familiar, but at first, many couldn’t place it. However, many of them clearly recognized the name, and were instantly shaken. Then, people look over to see what the middle-aged soul cultivator was looking at, whereupon more shouts of astonishment filled the air! All of the soul cultivators were shaken, and soon, as their cries of astonishment rang out, more people heard, leading to even more unsightly expressions. Originally, Bai Xiaochun’s name was not very widely known in the Wildlands. However, after the Giant Ghost Legion’s recent attack on the Great Wall, his name became the talk of the army, and from there, spread out into all of the Wildlands! He had defeated the Giant Ghost Legion over and over again! He had inflicted heavy casualties on the vengeful soul forces of the Wildlands! He had not only led the Starry Sky Dao Polarity Sect’s forces to victories on the Great Wall, but his methods had been spread to the other three riversource sects, leading to similar victories on other stretches of the Great Wall. Because of that, the Wildlands had suffered defeat after defeat, which was completely unprecedented! Exploding pill furnaces! Driving beasts to madness! Soul Convergence Pills! Any one of those tactics would have shaken the Wildlands. Then there was the reward being offered for Bai Xiaochun’s head, which skyrocketed to such heights that everyone in the Wildlands was flabbergasted. Furthermore, his rank of major general had been achieved by brazenly trampling the Wildlanders under foot with impunity! Because he had eventually gone missing, people started to forget about him. But now, his name had appeared on the Hell-Emperor Stele, causing instant chaos in the area! Countless eyes came to be fixed on the name list, where there, right out in the open for everyone to see... was Bai Xiaochun’s name! 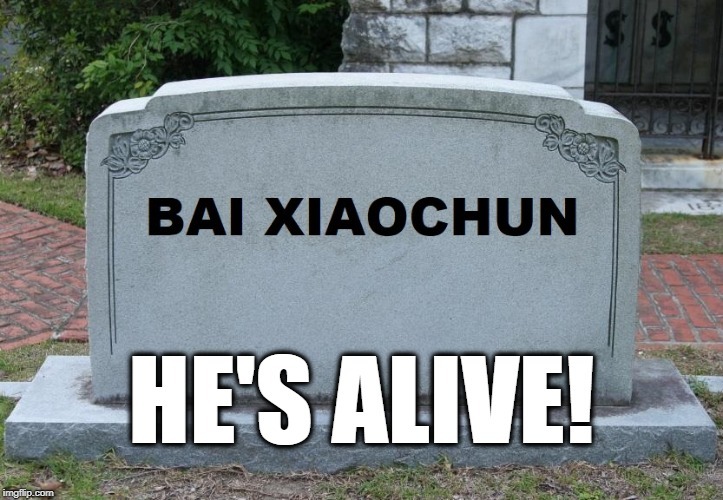 It was not Bai Hao... it was Bai Xiao Chun! Three characters made up his name, and right next to it was the number one, indicating that he had performed a single spirit enhancement on his nascent soul. It didn’t take long... for all of Arch-Emperor City to be completely shaken!